Icebreaker is an abstract strategy/action arcade game in which you control a pyramid and you try to destroy all pyramids on a grid while other pyramids stalk you. I created the original game and controlled the design of all additional game elements. I also wrote virtually all of the software for original version of the game, which was published by Panasonic for the 3DO Multiplayer in 1995. Unfortunately, 3DO ultimately lost the battle of the 32-bit video game machine, and if no one was buying 3DO players, then no one was buying games for it either. 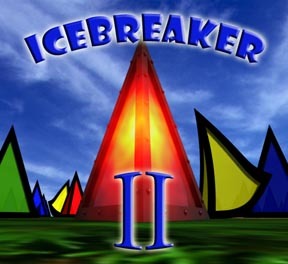 Luckily, Magnet Interactive Studios ported Icebreaker to both the Mac and the PC, and those versions were published by 20th Century Fox in 1996. Unfortunately (again), Icebreaker was released just as the bottom was dropping out of the CD-ROM market, so it wasn't a success on those platforms either, despite critical acclaim. And shortly after that, Magnet went out of business, and I turned away from videogame design with the beginning of Looney Labs and the invention of Fluxx. Icebreaker 2 is a sequel I was working on when Magnet sank. It was totally unavailable for over a decade. Then in 2007, amazingly, it was published in a very limited run for (the 3DO only) by OlderGames.com. Sadly, as of 12/14/7, OlderGames changed ownership and is no longer selling this rarity. July 2005: The 3DO Encryption Method has been Broken! May 2007: Icebreaker 2 Release Date Announced!